Enzymes of the citric acid cycle. The citric acid cycle, also known as the Krebs cycle or the tricarboxylic acid cycle, is at the center of cellular metabolism, playing a starring role in both the process of energy production and biosynthesis. It finishes the sugar-breaking job started in glycolysis and fuels the production of ATP in the process. It is also a central hub in biosynthetic reactions, providing intermediates that are used to build amino acids and other molecules. The citric acid cycle enzymes are found in all cells that use oxygen, and even in some cells that don't. The examples included here are taken from several different organisms. The eight reactions of the citric acid cycle use a small molecule--oxaloacetate--as a catalyst. The cycle starts by addition of an acetyl group to oxaloacetate, then, in eight steps, the acetyl group is completely broken apart, restoring the oxaloacetate molecule for another round. In a typically biological twist, it's not quite this simple. You might imagine that the enzymes could just pop off the two carbon atoms of the acetyl group, using the oxaloacetate as a convenient carrier. However, by carefully labeling particular carbon atoms in these molecules, scientists have found that things get shuffled around a bit, and two carbon atoms in the original oxaloacetate are the parts that are actually released as carbon dioxide. Then, at the end of the cycle, the original acetate atoms are shuffled around to recreate the oxaloacetate. The citric acid cycle provides the electrons that fuel the process of oxidative phosphorylation--our major source of ATP and energy. As the acetyl group is broken down, electrons are stored in the carrier NADH, and delivered to Complex I. These electrons then fuel the production of a proton gradient by two proton pumps: cytochrome bc1 and cytochrome c oxidase. This proton gradient then powers the rotation of ATP synthase, buiding ATP. All of this action occurs in our mitochondria--the citric acid cycle enzymes are inside the mitochondria, and the protein pumps are in the mitochondrial membrane. The cycle gets started with the enzyme citrate synthase, shown here from PDB entry 1cts . 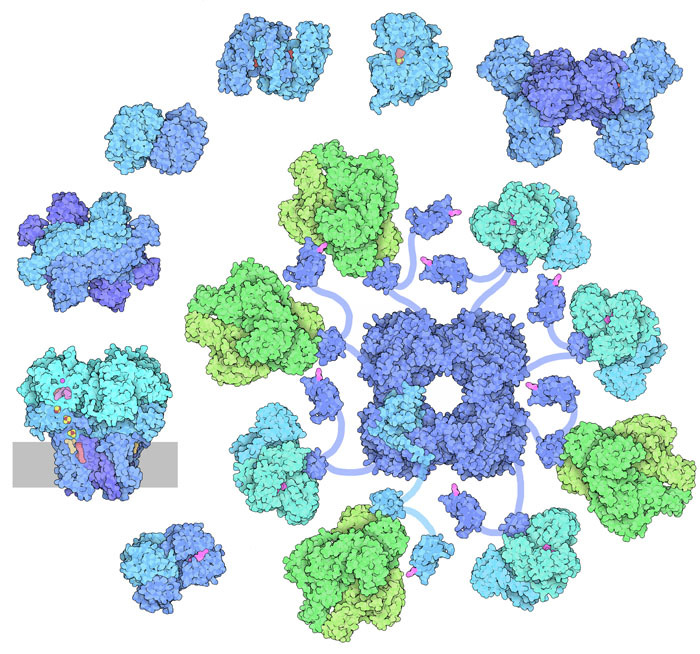 The pyruvate dehydrogenase complex has previously connected an acetyl group to the carrier coenzyme A, which holds it in an activated form. Citrate synthase pops off the acetyl group and adds it to oxaloacetate, forming citric acid. 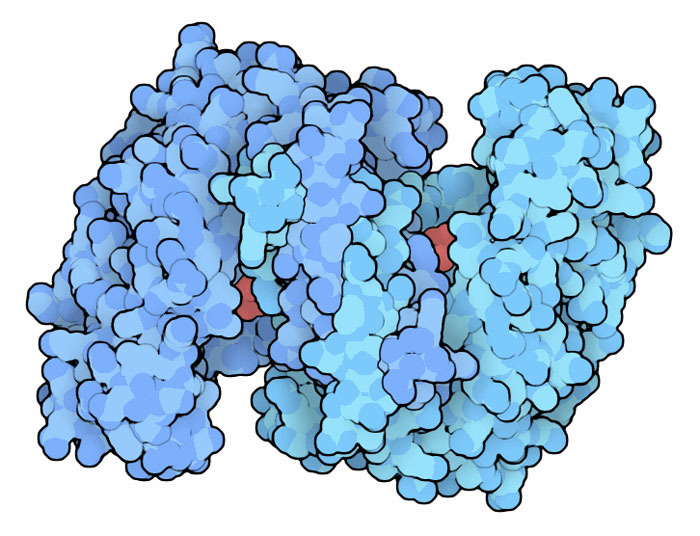 The enzyme opens and closes around these molecules during the reaction--to explore the structures, take a look at the Molecule of the Month on citrate synthase. The citrate formed in the first step is a bit too stable, so the second step moves an oxygen atom to create a more reactive isocitrate molecule. Aconitase, shown here from PDB entry 7acn , performs this isomerization reaction, with the assistance of an iron-sulfur cluster. To explore this reaction, take a look at the Molecule of the Month on aconitase. The real work begins in the third step of the cycle. 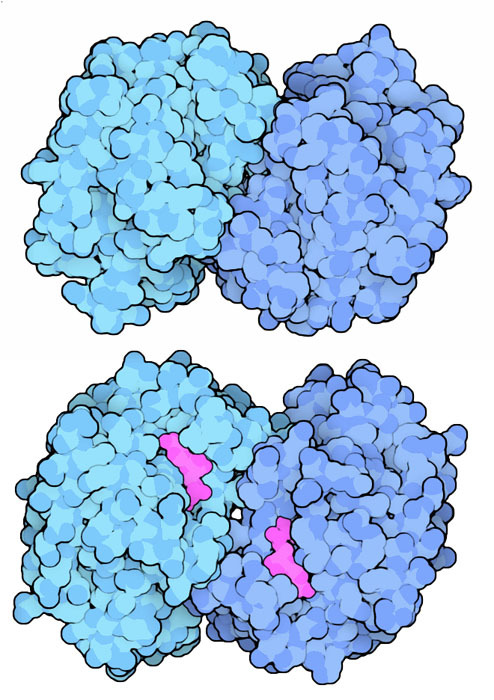 Isocitrate dehydrogenase, shown here from PDB entry 3blw , removes one of the carbon atoms, forming carbon dioxide, and transfers electrons to NADH. 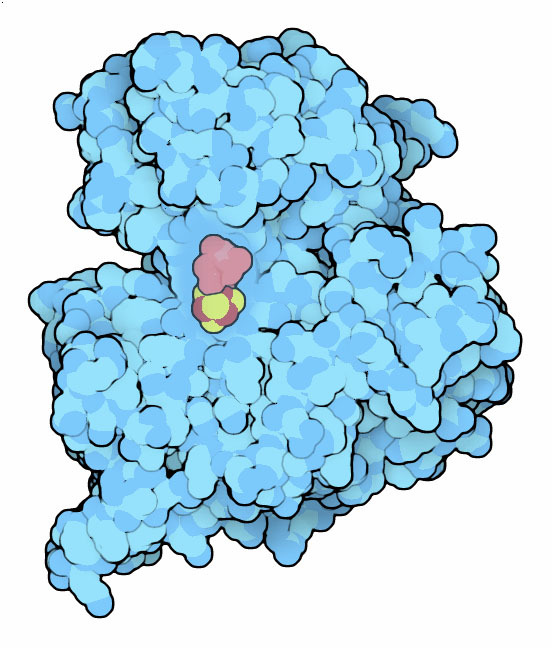 To explore this molecule in more detail, take a look at the Molecule of the Month on isocitrate dehydrogenase. The next step is performed by a huge multienzyme complex, similar to the pyruvate dehydrogenase complex. A lot of things happen in this complex. Another carbon atom is released as carbon dioxide, electrons are transferred to NADH, and the remaining part of the molecule in connected to coenzyme A. The complex is composed of three separate enzymes, all connected by flexible tethers. 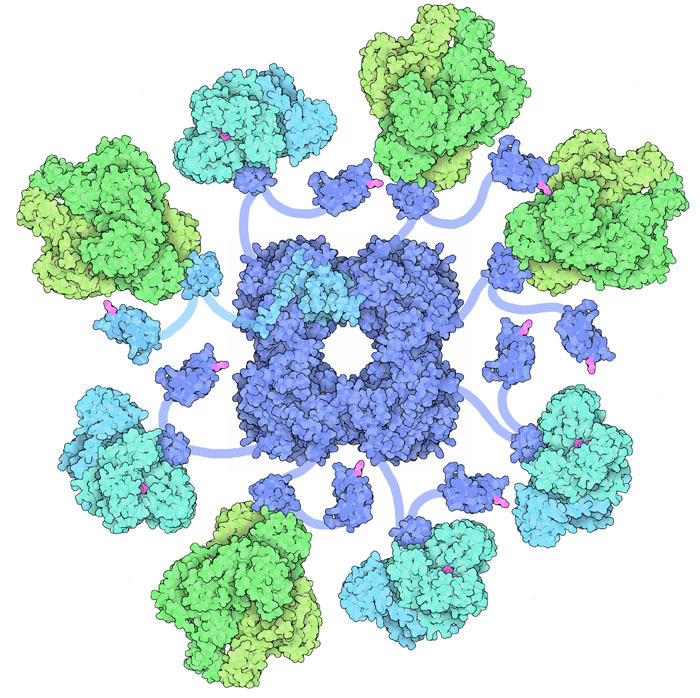 The illustration shown here includes only a few of the tethered molecules--in the actual complex, the central core is surrounded by 24 enzymes. This illustration was created using several PDB entries: 1e2o , 1bbl , 1pmr , 2eq7 , and 2jgd . 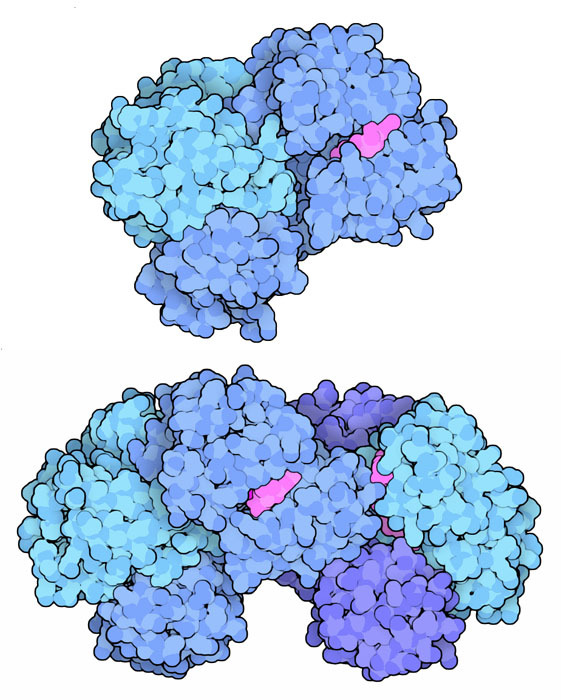 Succinyl-CoA synthetase from mitochondria (top) and bacteria (bottom). The fifth step is the only step in the cycle where ATP is made directly. The bond between succinate and coenzyme A is particularly unstable, and provides the energy needed to build a molecule of ATP. 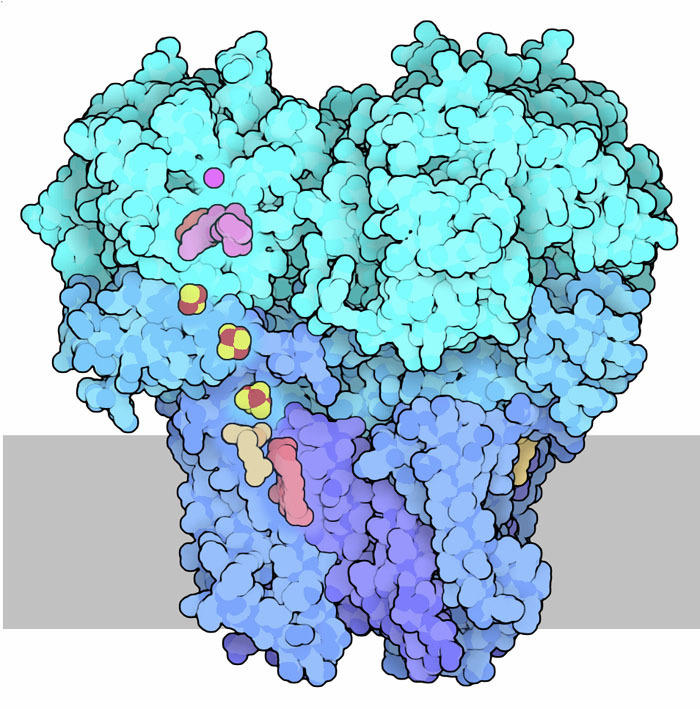 In mitochondria, the enzyme (shown on the top from PDB entry 2fp4 ) actually creates GTP in the reaction, which is readily converted to ATP by the enzyme nucleoside diphosphate kinase. 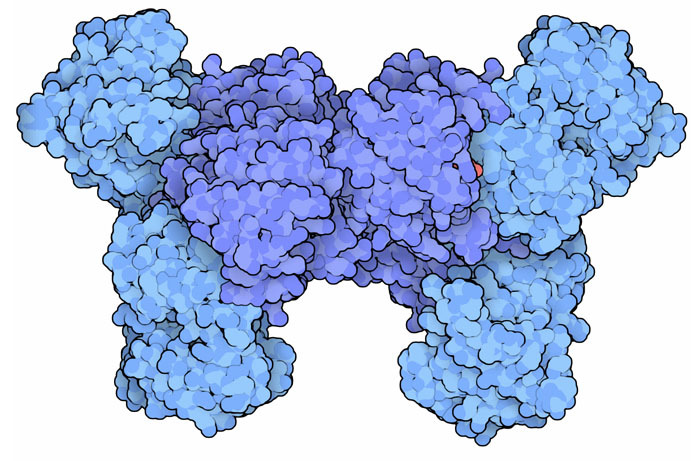 A similar form of succinyl coA synthetase is found in the cytoplasm, which uses ATP and is thought to be mostly involved in the opposite reaction, creating succinyl-CoA for use in biosynthetic tasks. A bacterial form of the ATP-dependent enzyme is shown on the bottom from PDB entry 1cqi . Succinate dehydrogenase, with the membrane shown schematically in gray. The sixth step is performed by a protein complex that is bound in the membrane of the mitochondrion. It links its citric acid cycle task directly to the electron transport chain. It first extracts hydrogen atoms from succinate, transferring them to the carrier FAD. With the help of several iron-sulfur clusters and a heme, these are then transferred to the mobile carrier ubiquinone, for transport to cytochrome bc1. 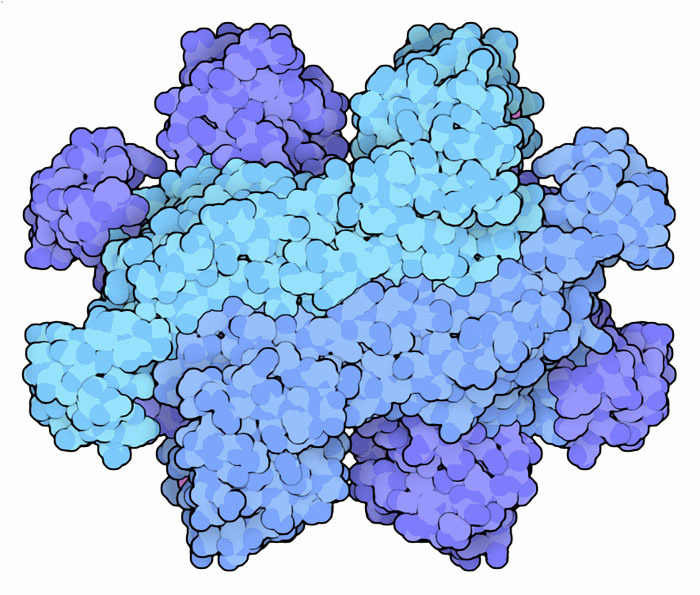 The complex shown here is from bacteria, from PDB entry 1nek . The seventh step is performed by fumarase, which adds a water to the molecule and gets it ready for the last step. A bacterial form of the enzyme is shown here from PDB entry 1fuo . In our cells, the enzyme is found both in the mitochondrion, where it plays its role in the citric acid cycle, and in the cytoplasm, where it is thought to play a role in biosynthesis and surprisingly, the response to DNA damage. However, our cells only have one gene for the enzyme, so a complex process based on the timing of protein folding is used to target some of the enzyme to the mitochondrion and leave some in the cytoplasm. Malate dehydrogenase from mitochondria (top) and cytoplasm (bottom). The final step of the citric acid cycle recreates oxaloacetate, transferring electrons to NADH in the process. Malate dehydrogenase is found in both the mitochondrion and the cytoplasm--the mitochondrial form is shown at the top from PDB entry 1mld and the cytoplasmic form is shown at the bottom from PDB entry 5mdh . Together, they help solve an important problem in energy production: some NADH is produced by glycolysis, but it can't cross directly into the mitochondrion for use in energy production. Instead, the two forms of malate dehydrogenase form part of a shuttle. In the cytoplasm, NADH is used up to convert oxaloacetate to malate. Then, malate is transported into the mitochondrion and is used to recreate NADH by conversion of malate to oxaloacetate. You can explore these structures in detail by clicking on the accession codes and choosing one of the methods for 3D viewing. In many cases, the citric acid cycle enzymes are very similar when you compare the forms made by different organisms. You can use the Compare Structures tool to look for similarities and differences in the structures available in the PDB.